I think I might have set a record from airworthiness inspection to first flight. Funny enough as soon as Steve left I started putting the plane back together. All the covers went on and the plane became ready to fly the same night. Then I checked weather and found that over this weekend Seattle was scheduled to have unbelievable weather.. So I told Bekah I wanted to get out and fly Friday morning before the airport became a zoo over the weekend. All things looked good the next morning both with the weather and with the machine itself, so literally less than 18 hours after I got my airworthiness 704CH was airborne over Paine field. First flight went well and everything as planned. Basically first flights are mainly to just pretty much make sure the plane flies as designed, and nothing more. I was incredibly nervous to the point where even my radio calls were not as smooth as I had liked. Lucky for me I called the tower ahead of time and told them my plan. Take off, climb in the pattern out of their airspace, and orbit directly above for about 30 minutes, then descend into the airspace in the pattern and land. Bekah had a handheld and monitored from the ground, also she caught a few pics, and a I got a full length video from inside the plane. I cut the video down to less than 5 minutes so that all the good parts can be viewed for those who don't have a lot of time. ;-) I mainly got the takeoff and landing on the video.. 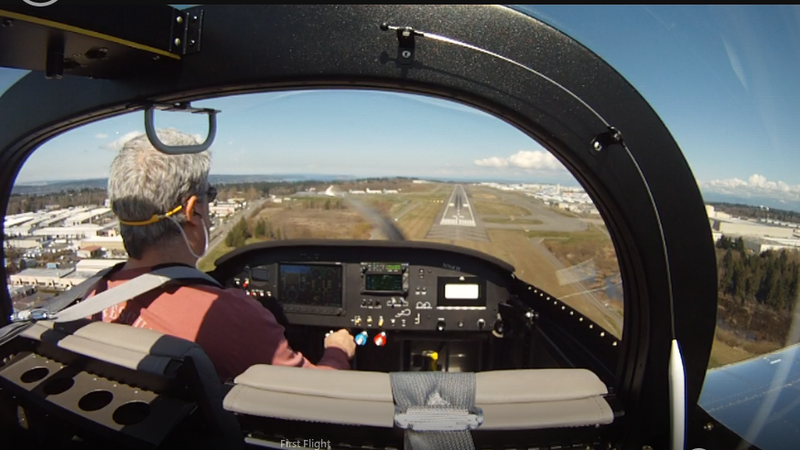 Please, no peanut gallery comments about the slight left turn on takeoff, which catches a lot of first time pilots in RVs. I did nail the landing pretty good for a first landing though. 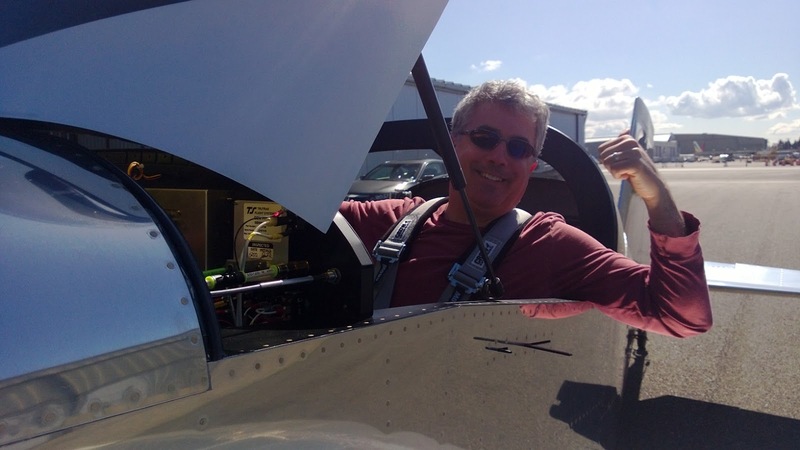 All else went well, but boy was I nervous and excited when finished to have flown the plane ! I had some challenges finding a local DAR, but ended up getting Steve Knopp from Camano Island. He signed up late notice, pushed my paperwork through the FAA and showed up on time less than a week after I contacted him. He was great I would really recommend him for any aviation type maintenance or DAR work that you might need. The plane became something more than a hunk of expensive metal in about 2 hours, with the airworthiness certificate, this is now an actual airplane ! So, as I wait for my FAA Inspection I wanted to run the engine for another 5 minutes or so and check the brakes along with a taxi test. All went well, did a quick run-up at the end and things are looking good. The airplane really wants to Fly.. This is how it will look on the first flight. I will get the bottom cowl primed white soon, but probably not until later in the spring, I don’t want to delay anything right now.. The FAA is delaying things enough for me to have to deal with. Here is a Low Quality Video of my first Taxi ! I went down to Oregon to train with Mike Seager who is a factory endorsed Transition instructor. Things went well and I got 11 hours with him after a few weather delays. Flying the RV is definitely different than the other tail draggers I have flown, so I am glad to have taken the training. We ended up doing an extra hour so that I could get to my 25 hour insurance minimum, but it was fun because we were able to go deeper into wheel landings, short field landings, slips and engine out scenarios etc.. It really was a great well rounded training. When I got back I decided it’s time to get serious, so I got my data plate on the plane and put the wing root fairings on for the last time before first flight. Everything in the plane is ready to fly now, but my inspection won’t be for a few days. After some challenges with scheduling of my first DAR, I have a new one who is much more responsive and looks to be able to turn things around pretty quickly. So I am looking forward to having him look at the plane and sign me off by end of next week ! 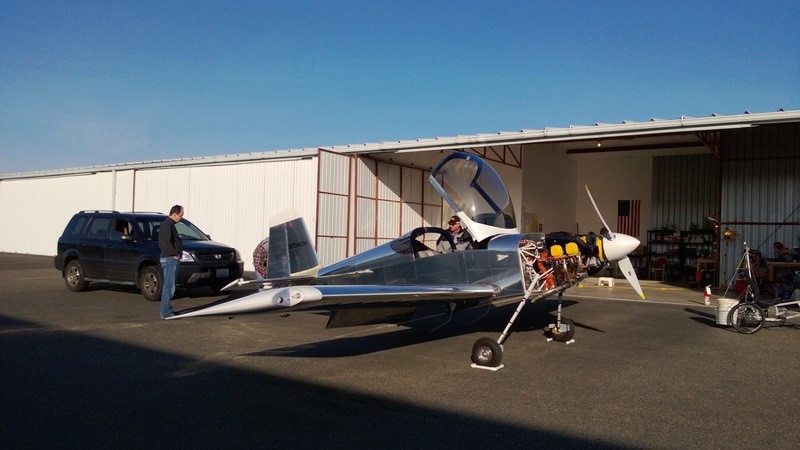 I still have some minor things to do on the plane, so the next week or so will consist of another quick engine run with the cowling on; wrapping my fuel flow transducer with fire sleeve, double checking everything for leaks, and making sure the Skyview is set up correctly, checking the tires and getting ready to Fly ! After being so quiet for so long, my engine finally was able to make some NOISE ! The first engine start was a success, but it didn't go without a couple hitches.. First the plan was to see all the fuel line junctions by removing all the fairings that I had to install for the weigh in. That didn't take to long, then I had to verify all my fuel lines were torqued and looked good. Also I had to upgrade my Dynon to 5.1 which includes data logging which is perfect timing for me because I can track multiple times a second all the temps and pressures of my engine during start up and break in. To prep the engine I had to turn the prop several times to get oil up the oil pressure hose. This also pushed oil all around in the engine so it was good to do prior to the first start. Vans indicates you pull the top plugs and hit the starter to do this. I found turning by hand several times pushed oil up the hose and primed the pressure line just fine. So I replaced the plugs including anti seize and torqued them. Things were looking good at this point. 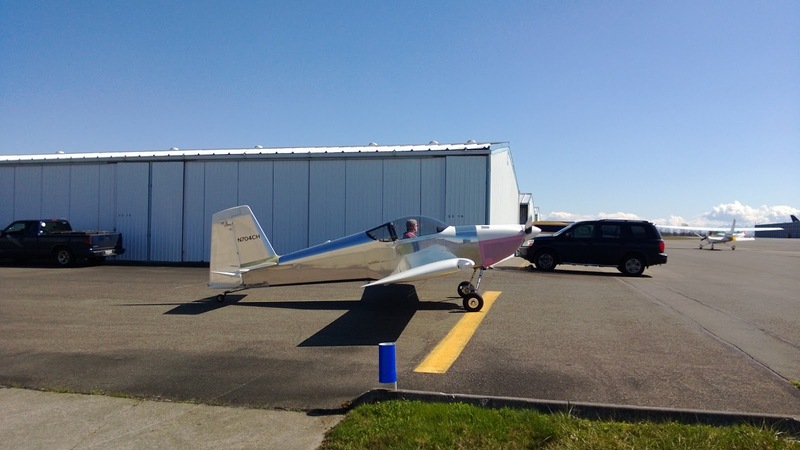 Now it was time to start working with the Blue 100LL Avgas, it sure was pretty in the sunshine. I put a gallon or so through each tank and sloshed it around, then fully drained each tank. I am almost 100% confident that the tanks were pristine to begin with, but just in case, it is a good idea to rinse them out. First glitch came up when I tried to run fuel to prime the fuel pump. Turning the pump on didn't do anything. I had disconnected the fuel line at the spider and nothing would happen. I had to get fuel to the pump so used a siphon technique to get fuel to the pump which worked fine and from that point forward fuel pump was able to pull from both tanks with adequate pressure. All was looking good, pulled the plane out of the hangar, tied it to the car and set up a few cameras.. Confirmed that all the assistants there were looking for the same stuff and communication was working OK. Went over everything a final time and then jumped in the plane, full of stress ready to fire it up. Sure I had a checklist and knew exactly what I was going to do, I even read it and double checked it but sure enough the first couple attempts at starting I had forgot to turn the mags on.. No way would it fire without the ignition on, so once that problem was corrected it fired right up.. Man was I stressed..
Then I noticed that my RPMs were reading as double due to the Electric ignition sending two pules per revolution vs just one. I have since corrected this, but during the engine run I just idled it at an indicated 2000 rpm (which really was 1000). The engine ran great, but was rich at idle causing a bit of roughness which I will need to look at over time. 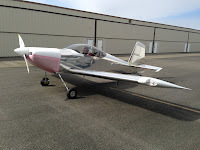 I ran it up and cycled the prop, tested each ignition and then back to idle. I then leaned it out quite a bit at idle and it started to run much smoother. Did a quick idle lean test and noticed it raise a few hundred RPM, which is consistent with being too rich.. Then shut her down. You really don’t want to run the engine much on the ground when you need to break it in. The only way to break in an airplane engine is to run it at high power in the air for several hours. I will never forget the slight smell of burning as the new engine came to life. It really smelled brand new, sort of like a new car, but it was a new airplane. It was wonderful ! 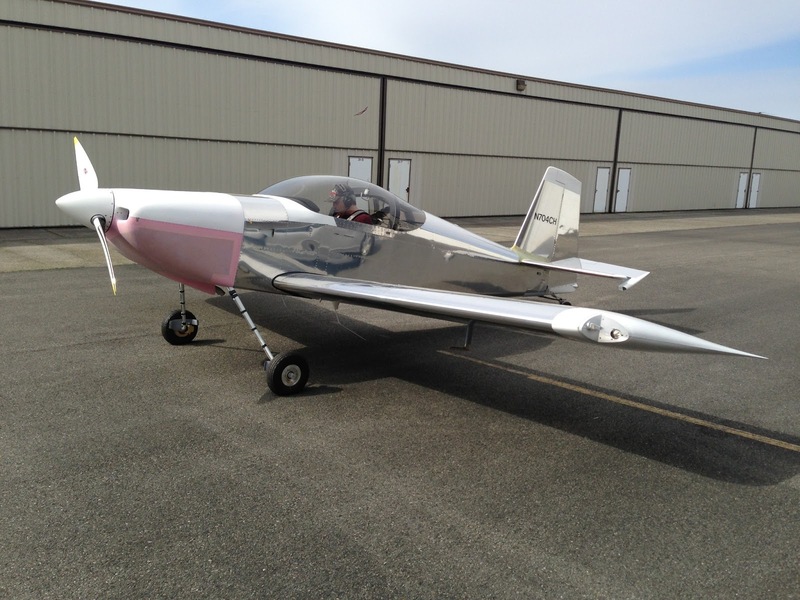 I wrestled with the Empennage fairing for a couple hours toward the latter part of last week. My plan was to get it to a flight ready state, then come back through and clean it up later. Well that is sure what I did.. From my perspective it is unacceptable for long term, but definitely safe and fine for the first few flights. I need to go through and do a lot of fiberglass work on it to make it fit better, but the weather needs to warm up and I might as well do the fairing work when I am doing the wheel pants and the gear leg fairings since they are all fiberglass too. Here are a few shots. The current fairing puckers between screws and it doesn’t really sit well on the leading edge of the horizontal stabilizer. But functional and safe.. yes.. I borrowed scales from a fellow EAA chapter member to do the weigh in. After a couple snafus with getting the scales to power on, things went pretty well. I used a bathroom scale to weight the tail, but calibrated all the scales by jumping on them myself and confirming I weight the exact amount on all three scales. Now I don’t weight as much as an airplane, but definitely enough to confirm the scales had plenty of weight on them and were all providing the same results. I rolled the plane up onto the two main wheel scales first, then raised the tail to level out the longerons at the cabin area which confirms a flight level attitude. To achieve this the tail has to be really high, but this is the only way to properly weigh the plane. Here are some pictures and the final results.. Basically she came in at a great empty weight and light enough on the tail to give plenty of loading options. The empty CG came it at 80.34 which isn’t as far forward as it could be (the further forward the better) but definitely in a good position. The valid CG Range is 78.80 -86.82.. I won’t go into all the details of aircraft weight and balance, but it’s very critical and things are looking good for 704CH !